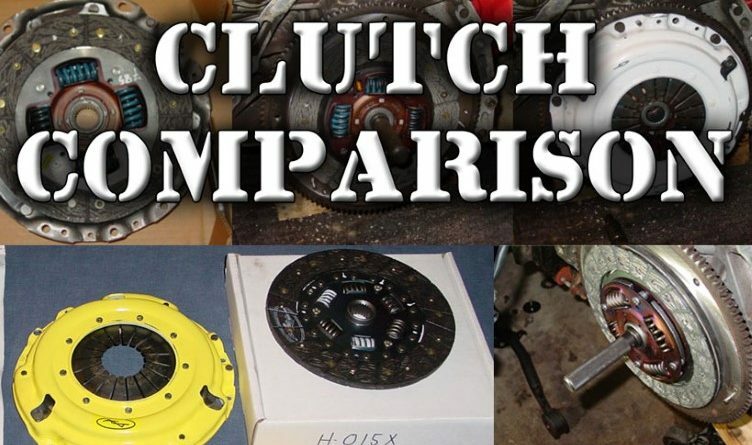 Over the past decade and change, I’ve had a chance to experience a few different clutches and I wanted to share my thoughts on each. 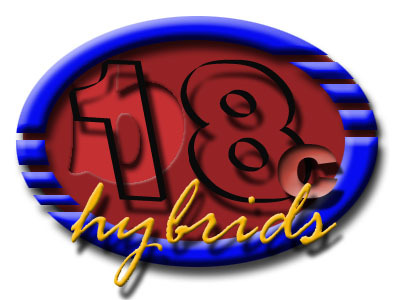 All of the clutches were installed on a Honda B18C1, engine. This was definitely an “extreme” setup. Engagement was extremely harsh. When trying to slip this clutch, it chatters horribly. Daily driving with this clutch was nearly impossible. I damaged axels and transmission bearings. Along with the harsh engagement, the clutch pedal became stiffer than the brake pedal. Trying to launch with this clutch is also very difficult. Unless you are willing to launch at extremely high rpms, with slicks, this is not a drag racer’s clutch. These pics show 14,000 miles of use. There is an obvious grove worn into the pressure plate and flywheel. Also, the clutch was completely worn out. Again, this is a race track clutch. 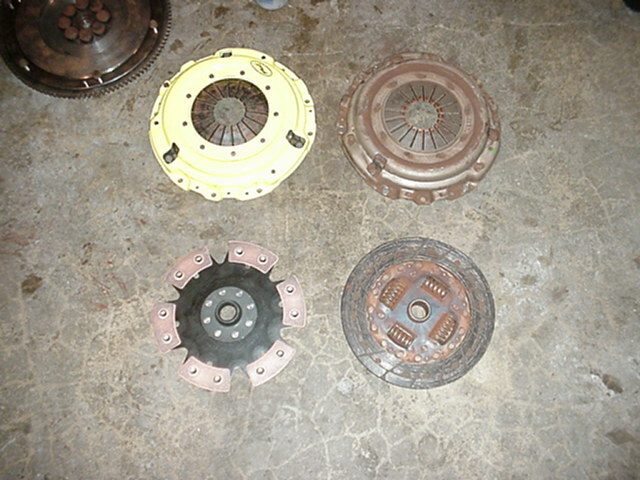 This is the clutch setup I installed after the 6-puck. It is the same pressure plate but with an organic disk. As far as engagement is concerned, this is a much more forgiving setup. However, the pressure plate is still entirely too stiff. 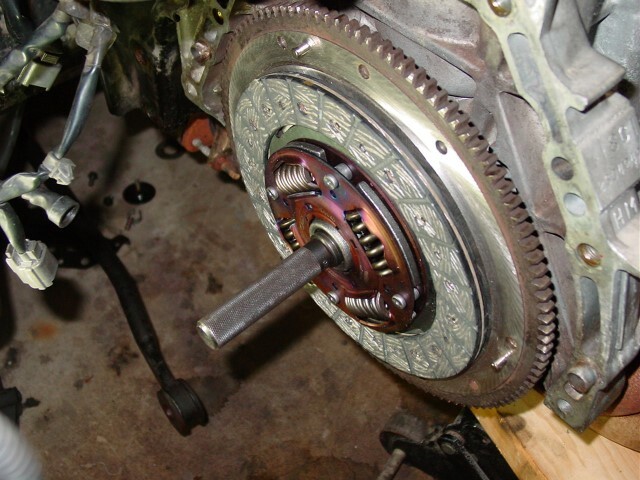 Because of the pedal pressure, it can be difficult to smoothly engage the clutch. This setup eventually led to main-shaft bearing failure. I’ve experienced this setup in a few different vehicles. This is a much more forgiving setup. My only issue with this setup involves pedal pressure and the engagement point feel odd. It feels as if the pressure plate springs are not linear. It’s not a big problem and becoming acclimated doesn’t take long. After all of my unfavorable experiences with ACT, I deciding that I would never run one again. 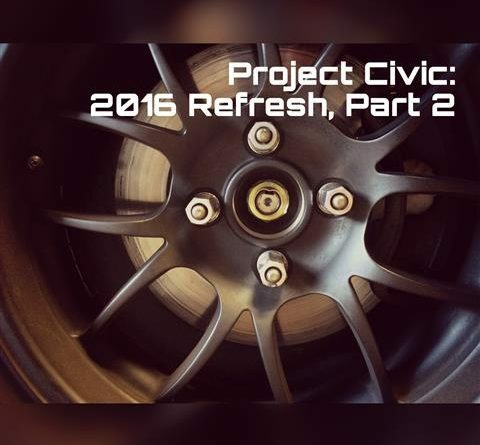 I followed a recommendation and installed the Clutchmasters stage one clutch in my Civic. The pedal pressure is extremely light to the point where I would claim that it is lighter than OEM clutch. Clutchmasters was able to increase clamping force while reducing pedal effort by relocating the pivot point of the springs. The one drawback to this clutch is that the disk is very grabby. Organic materials can be grabby (as compared to Kevlar disks). I had a great deal of difficulty with chatter with this clutch. This wasn’t an isolated issue as I experienced the same with another vehicle equipped with the same clutch. Bottom line, you can do better for the money. I installed this on my brother’s turbo Integra after we rebuilt the transmission (bearing failure due to the ACT extreme pressure plate). The carbon kevlar disk engages very smoothly. Pedal pressure is only slightly heavier than stock. The clamping force is also the same as the extreme pressure plate from ACT but without the required massive pedal effort. The only real drawback with this clutch is the cost. 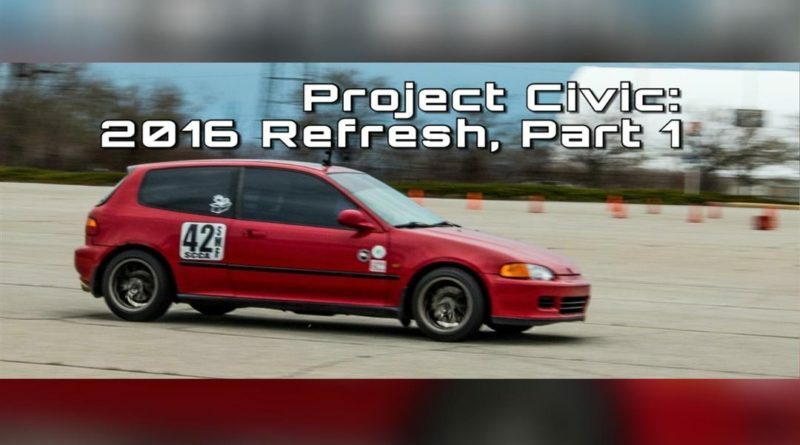 It is one of the more expensive street clutches out there. If you don’t mind spending the money, this is a great clutch! While I was rebuilding my transmission, due to an unrelated issue, I decided to get rid of my touchy Clutchmasters Stage 1 and picked up a stock Honda clutch. Logically, my all motor setup didn’t need much more than a stock clutch since torque output hasn’t increased by much. The stock clutch engages very well and has light pedal pressure. There are two drawbacks. 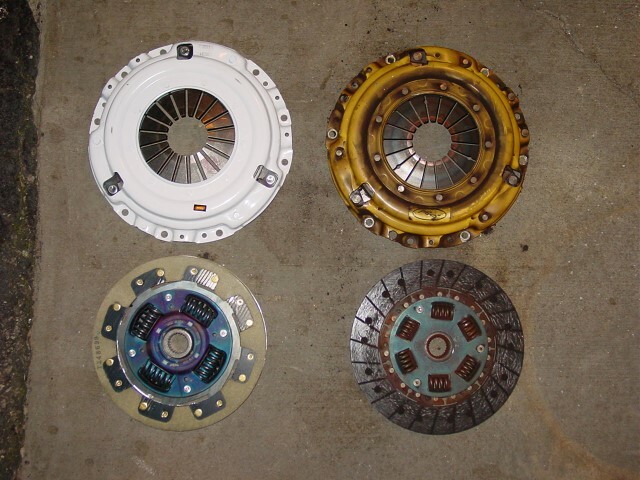 When I installed this clutch (in 2004) Honda did not sell a clutch “kit”. You have to buy a pressure plate, disk, release bearing, and pilot bearing separately. If you can’t find a cheap plastic centering tool, you’ll have to buy the one from Honda for $50 or so. Using a stock clutch is an expensive solution. The second issue is more important. 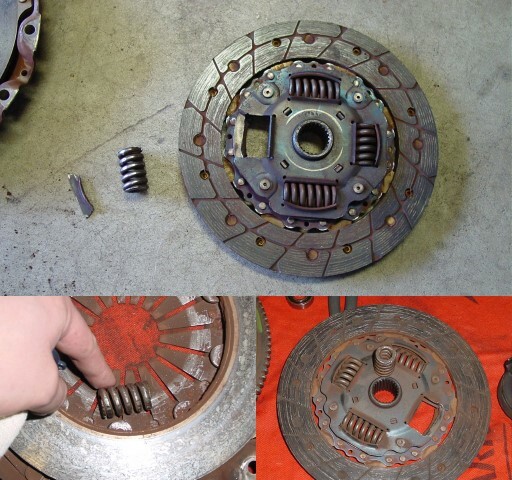 The stock clutch was known to lose it’s springs. I thought this was an old issue that had been resolved, but at 37,000 miles, a lost a spring. 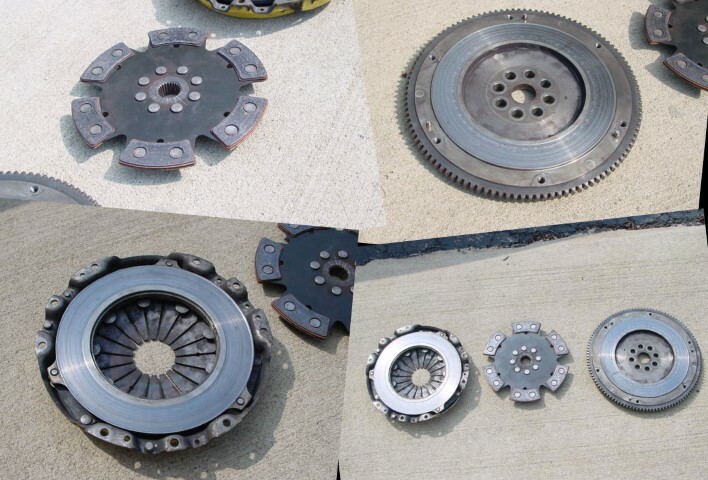 Since the clutch is still fragile, and the cost is high, using a stock clutch is not smart. I just wish I had realized that ahead of time! NOTE: Since I used this clutch, it appears that Honda has changed suppliers for their OEM clutches. The cost is considerably lower and I would certainly hope the broken spring issue has been addressed. The new price is low enough that it makes it the cheapest alternative. I also understand that the OEM supplier is the same company that builds Exedy clutches and that this is their OEM replacement clutch. Bang for the buck, this is the best clutch I’ve ever used. For a reasonable price, you get a clutch with very smooth engagement, only slightly higher than stock pedal pressure and reliability you can count on. I’ve experienced this clutch in more than one case and I’m very pleased. 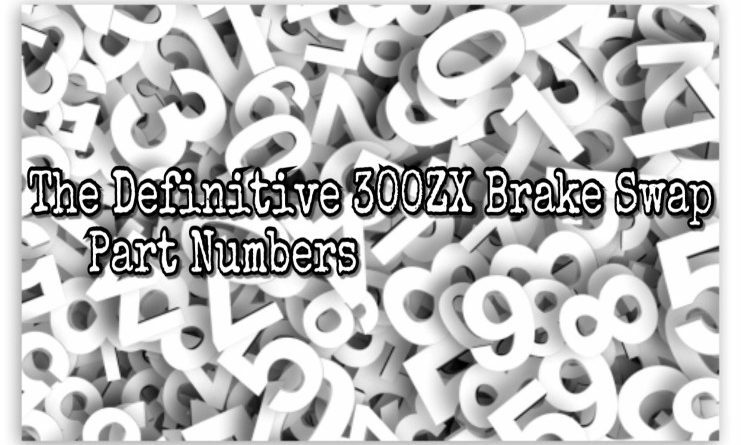 The cost is lower than any variation of the Clutchmasters clutch and it includes the pressure plate, disk, release bearing, pilot bearing and clutch centering tool. 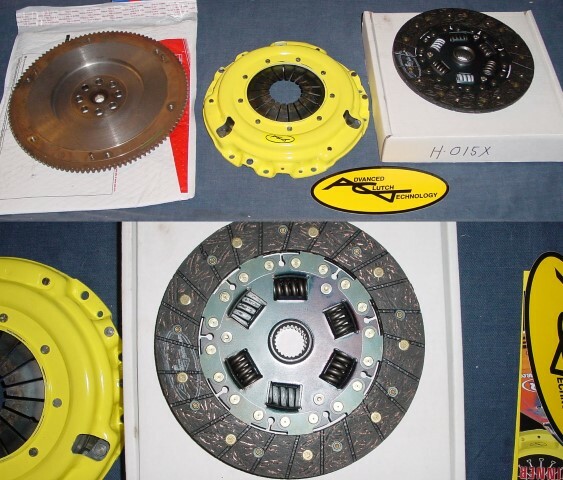 Bottom line: Unless you need a dedicated racing clutch, there is no reason to use anything other than the Exedy clutch.